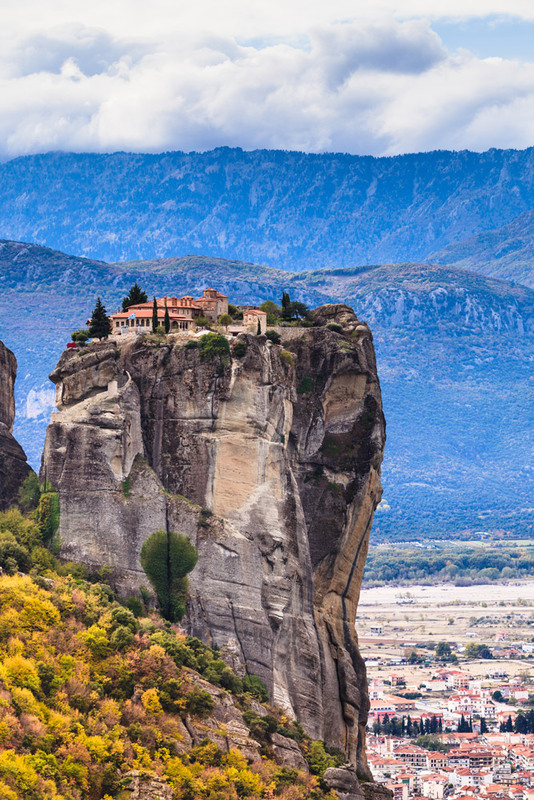 The Ultimate escape: Monastery of the Holy Trinity, Greece. Not for everyone! When’s the last time you were able to escape? I mean really escape. Maybe there was a trip to the islands or a weeklong cruise without the kids, but for most of us that feeling of escape is fleeting and short lived at best. It typically ends the minute we get back to the “real world” and all the things we were trying to escape from come running at us full speed. One week, even a few weeks out of the year just doesn’t seem like it’s enough—and it’s not. Because, while life is a beautiful and grand thing, it can also be complicated—let’s face it, there are often many things worth escaping from. When you factor in just how many and the unhealthy ways some people choose to do so, you start to wonder if there is a better way: a way where you can escape more than once or twice a year, a way where you can escape every day without harming your body, brain or bank account. There’s nothing wrong with an everyday routine. Most people have one and there is something comforting about having a plan, a system or a general schedule to take you through a week or even a month. Problem is, an everyday routine can quickly turn into an everyday rut. This kind of perpetual monotony can lead to feelings of being worn down, uninspired, depressed or deeply unsatisfied. For some of us changing our everyday routine itself is not an option. Those schedules are linked with other people and we don’t want to let them down. Luckily you don’t need to change your routine; all you need to do is change your environment. By adding the right bedding, designs and accents around your home, the monotonous can quickly become the marvelous. For instance, we spend such a large amount of time in our bedrooms. When we wake and sleep to the wrong fabrics, colors or patterns, our routine is flawed from the start. When we’re not living in the right design, we’re waking up on the wrong side of the bed every morning. Choosing the right colors can dramatically influence each and every day, making your drab routine, not so dull at all. And making sure you are sleeping in optimal comfort can sometimes make the difference between a bad day and a great day. Or maybe it’s seeing the same designs or colors day in and day out that force us into a web of monotony. At Schweitzer, we’ve got literally hundreds of designs and styles to choose from, including a variety of different fabrics and decor pieces to make sure you are never bored. With such a huge collection of products to help you escape the norm, you can easily switch up the look and feel of any room in your home anytime you want. Change it once a month or once a week. You’ve got our entire site at your disposal to keep your routine fresh, new and engaging. Do you have a place you go that makes you feel better when your overworked, overburdened and just plain stressed out? Imagine if that place was the room you spend a third of your life in. Although a good night’s sleep is essential, creating the right bedroom is not just about sleeping. Your bedroom should be a place literally designed to put you at your best each and every day. The right colors, the right look, the right texture and feel and yes, the right temperature can ensure you feel rested, relaxed and instantly at ease. It’s amazing what a positive, soothing experience in your bedroom can do for stress and the psyche. Whether it’s deeply calming blues and peaceful purples or the graceful images of embroidered garden flowers, the right bedding and decor can help you feel less stressed, cast off the day’s worries and wake up each and every morning with a better attitude. We all know how important a good night’s sleep is. And most of know that choosing the right bedding is a key factor in whether or not we’re able to achieve that. So why is it that so many people continue to suffer from poor sleep due to the wrong bedding? The trick to escaping bad sleep is creating the perfect sleeping environment. It starts with having the right fabrics and sheets at the right temperature. At Schweitzer Linen, you’ll find a full menu of luxurious fabrics in whatever thread count suits you, plush comforters for colder weather, cool, breezy linen when the temps rise and everything else you need to perfect your slumber paradise. Wherever you live, we have bedding that will comfort you and help you get the kind of sleep you need. A deeply rejuvenating, restorative sleep you may not have experienced in a long time. In addition to the right bedding, choosing the right colors and design can also affect how you sleep. The time before you go to bed is highly influential and it’s important when you get ready for bed that you are in the right frame of mind. The old saying, “Never go to bed angry” was never more true. The trick is finding the colors and patterns that work best for you so that by the time you lay down, your mind is already in the right place. When you finally rest your head down on your pillow to drift off, you should do so with a smile of contentment on your face. You deserve it. This is also true for waking up. The effects of a good sleep mean nothing if you wake feeling uninspired, negative or apprehensive about the day. When you change up the decor of your bedroom to best suit you, you are changing your entire perspective in the most positive of ways. The power of this can be felt all day long, The power of this change can dramatically improve your life. Even the most powerful people in the world have limits. And since I’m assuming you are more like me, and not one of the world’s most powerful people, it is safe to say that there are any number of things outside of our control and some things we just can’t change. We can try to influence and work hard to make a difference but at some point, the line is drawn and we are left with those things we have some level of control over. I choose not to see this as limiting—I see it as empowering. Being able to switch up a bedroom or room in our home to make us feel more alive, more energized, more inspired and yes happier, is something we can do—and do so easily. Once you realize that these tiny things we are able to control can have a huge effect on our lives and the people around us, you realize that in a way we can truly create our own worlds, our own realities. This change starts in the bedroom, in our living rooms, in our bathrooms. Implementing these small changes, taking control of our environments and making the decision to become better in every way is what helps us become the very best versions of ourselves and lead lives that are deeply satisfying and joyous. I’m not saying you’re not already a wonderful, beautiful person. I am sure you are. But if something puts you in a better mood, makes you smile more, feel less tired, be more optimistic, feel more beautiful, more confident, more content and happy to be alive — without requiring a prescription or a bottle opener, why wouldn’t you use it? Our products are designed to help you escape the things in life that are detrimental to your happiness, your comfort. The things that keep you from being the absolute best you. That person is there for the making. Sometimes all it takes is the right room.